PRODUCT: Hand Hammer Drive Pins, 1-1/4" long, 1/4" head, 0.140" shank diameter. For Concrete and Block. Made by Powers. Price/100. DESCRIPTION: Hammer Drive pins are designed for permanently fastening a fixture to concrete and some types of concrete block. Designed for use in a standard hand tool and should not be used in a powder actuated tool. 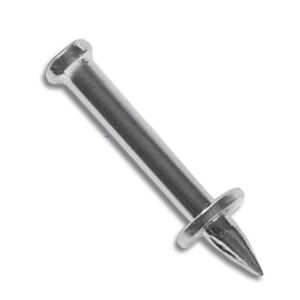 Pins are formed with 1/4" diameter head on one end, a 0.140" diameter shank in various lengths, and a specially designed point to allow proper penetration into the base material. 3/8" diameter steel washer is mounted over the point to retain the drive pin in the fastener guide of the tool and to provide guidance during the driving operation. Recommended for light duty static load applications where holding power is not a critical factor. Should not be used overhead. OPTIONS: Available in 3/4, 1, 1-1/4, 2, 2-1/2, and 3 inch lengths. Hand Hammer Drive Pins, 1 inch long, 1/4 in. head, 0.140 in. shank diameter. For Concrete and Block. Made by Powers. Price/100. Hand Hammer Drive Pins, 3/4 in. long, 1/4 in. head, 0.140 in. shank diameter. For Concrete and Block. Made by Powers. Price/100. Powers Hammer Drive Tool, Standard. Drives Hammer Drive Pins, Anchors, Spikes, etc. Price/Each.